Working internationally? Going on a trip? Then like me you probably have to lookup the current exchange rates for the country you’re dealing with. 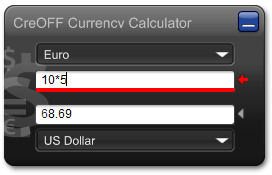 This is now made easier with your new desktop companion: CreOFF’s Currency Calculator. Imagine this if you will: you’re planning a trip, looking up flights and hotels etc… Wouldn’t it be nice if you could just recalculate the costs in your local currency? Without having to look up the currency rate first and opening your old trusty calculator and doing the magic trick of multiplying everything with the latest rate you looked up manually? In short: this is a widget I needed urgently, since I will be visiting the other side of the world soon and now I’m in the process of comparing so many prices. I wondered: “if only the VAT calculator could magically lookup currency exchange rates as well”. And voila: the idea of the currency calculator was born! There’s lots of ideas for extra features, but this is the stuff you need to keep it simple yet useful. Note: you do need Yahoo! widgets system to be able to run the widget.